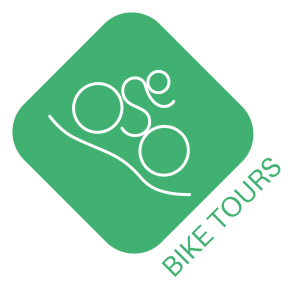 Self-Guided / Day Tour / Enduro – A challenging bike tour with many technical trails. Get your free GPS track here! 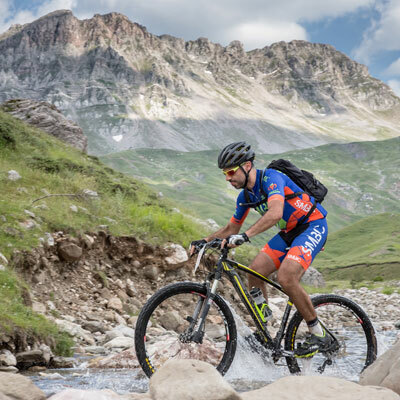 Important note for this tour: The two single trails from Nikia to the crater or crater rim are technically very difficult and require extremely good bike control, in addition there are some places in the trails with unsecured crash edge! 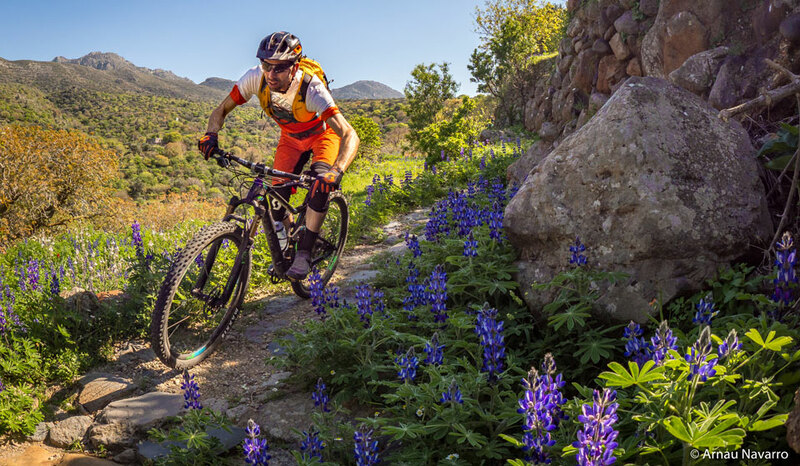 If you reach your limit on the first trail below Emporios, don't ride the trails at Nikia, but rather follow the Cross-Country “Nisyros Sightseeing Route” from Emporios for the rest of your bike tour! 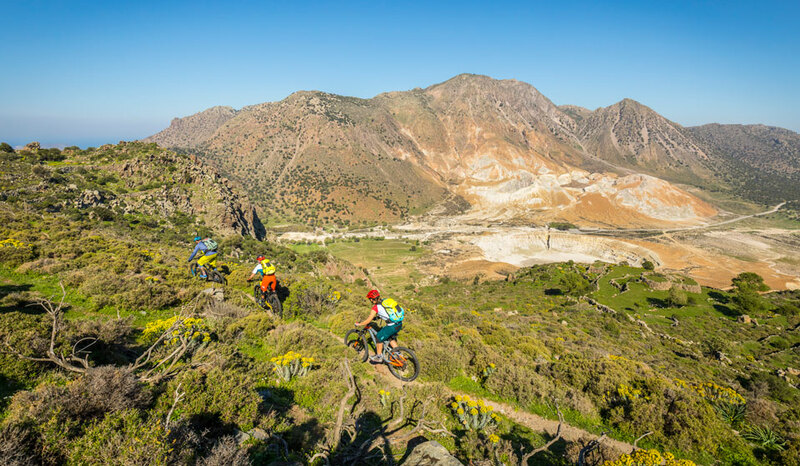 The "Best of Nisyros" enduro tour starts at the port of the island capital Mandraki in easterly direction. The first 2 km are an easy rolling on the flat coastal road, until you see a sign Nikia on the right side. 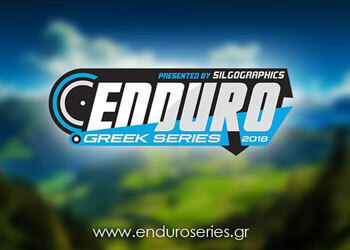 A 5 km (almost 330 m) long ascent on asphalt with many panoramic views of the Aegean Sea to the junction to Emporios follows. Here you turn right to Emporios, it goes for approx. 500 m on the asphalt road to below the village. Here an old stone path turns right. A 700 m long descent follows on this path. This has many, even higher steps and automatically leads you back to the asphalt road. Now follow this road uphill, paying attention to the signs for Nikia. Shortly before the village turn right to the chapel of Prophitis Elias with a great view of the village and the crater below. Then you ride a little bit back to the first turn-off and turn left. 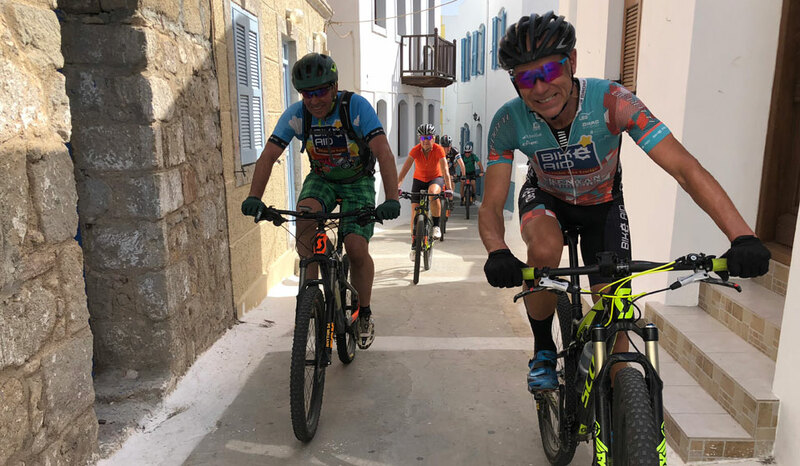 Shortly after you reach the chapel of Agios Ioannis Theologos and push your bike through the entrance to the terrace below the chapel. Here, a flat trail starts that leads over the terrace described above, and meets after approx. 400 m the trail, which leads here from Nikia. 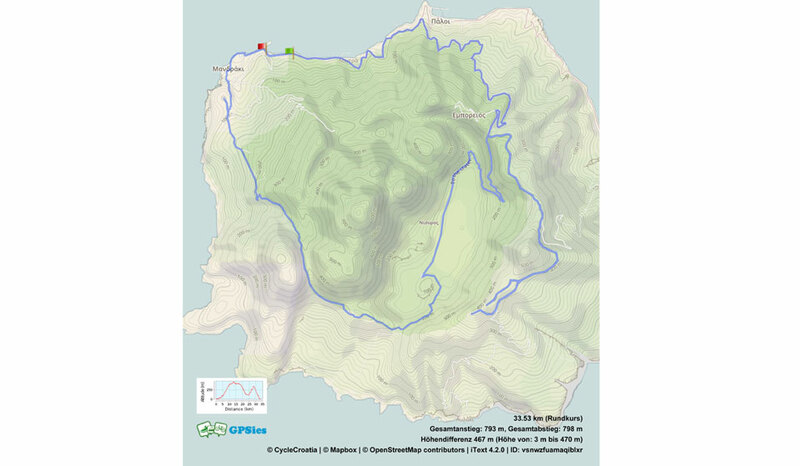 Now downhill for nearly 2km very technically with many hairpin bends and some steps down into the crater. This trail is very demanding! Via this trail you reach an old water pump in the plain and continue towards the road. Follow the road to the left to the kiosk at the Stephanos Crater and have a look at the different craters. Afterwards you can follow an asphalt road out of the crater. 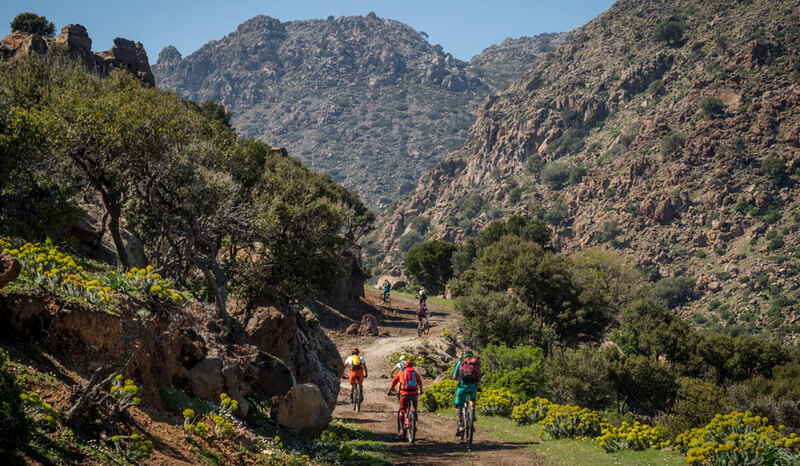 First it is almost flat for about 2km and then a demanding ascent for 3 km follows until you meet the way to Nikia again. Turn right here and continue uphill to Nikia. Follow the narrow alleyway into the village until you reach some steps and push your bike to the picture-book-like Plateia. There you'll find a place to stop for a break. Some steps at the back of the Plateia coffee bar lead to the next trail. Here you should push/carry briefly. On the one hand not to disturb the silence in the village, on the other hand not to leave any signs of abrasion on the whitewashed steps. Even if it would be fun to ride down these steps, we ask for consideration! Once you have left the village, a very steep downhill part on a stone path with many steps follows. After approx. 200m you leave this path and turn right onto a terrace with a stone wall. On this terrace you always bike along the wall, crossing some older stone buildings and soon you come to the path over the crater rim. Now a nice flowy piece follows, before it goes on a rough stone path. It has steps and hairpin bends that are not secured on the right side. Please be especially careful here! 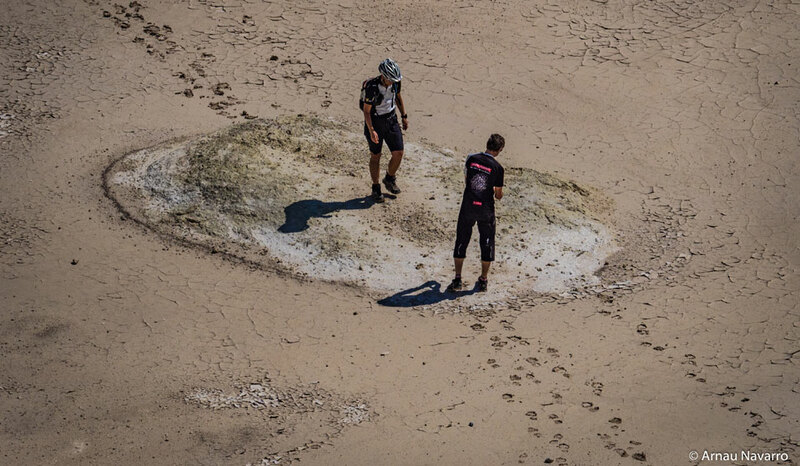 You will automatically reach a wider natural path that leads slightly uphill around the Stefanos crater and then becomes 2x quite steep on a short stretch. You pass a small monastery and then a downhill for a bit of rest follows, before you will face another 1km long steeper ascent. Afterwards it goes almost only downhill to Mandraki. Follow the same path until the underground changes to concrete. There you meet a T-junction. Here you can already see the entrance to the trail back to the harbor village, which you of course won't miss at the end of a great tour. After about 300m you reach the old Kastro with its giant walls. If you climb the walls, you have a great view of the port Mandraki. The final trail leads directly into the village and over narrow lanes along small white cubic houses to the promenade. Various taverns invite you to stop here. Self-Guided / Day Tour / Cross-Country: All the major sights of the island, but only a few trails. Get your free GPS track here! 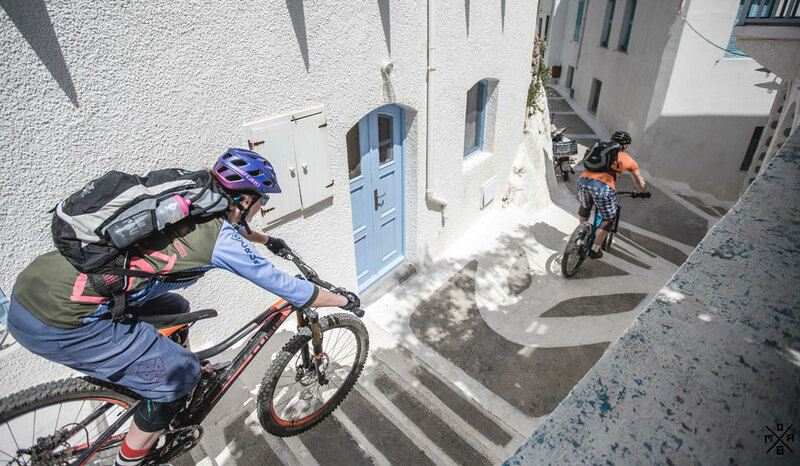 Nisyros Sightseeing Route: a biking tour that takes you to all the major sights of the island, but with only a few trails. This tour starts at the port of Mandraki in easterly direction. The first 2 km are an easy rolling on the flat coastal road, until you see a sign “Nikia” on the right side. 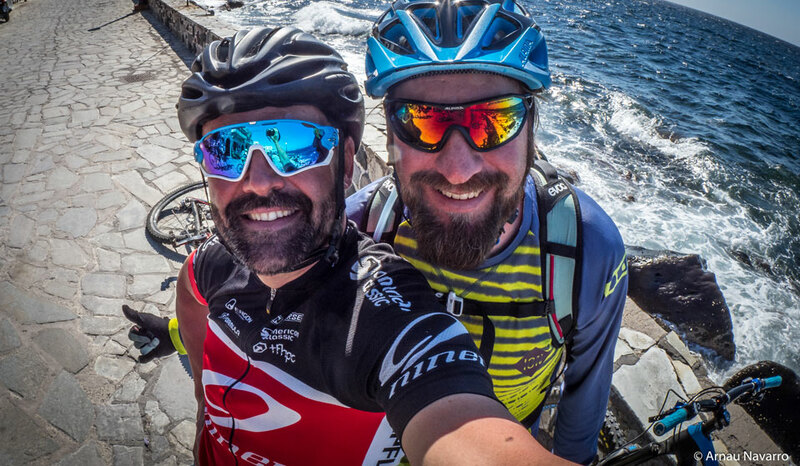 It follows a 5 km (almost 330 m) long ascent on asphalt with many panoramic views of the Aegean Sea. On the way you pass the junction to the mountain village of Emporios: make a detour to the village entrance and if you feel like it, you can also go to the natural sauna in the rock! Then follow the main road uphill again, where you were before, until you reach another turnoff. 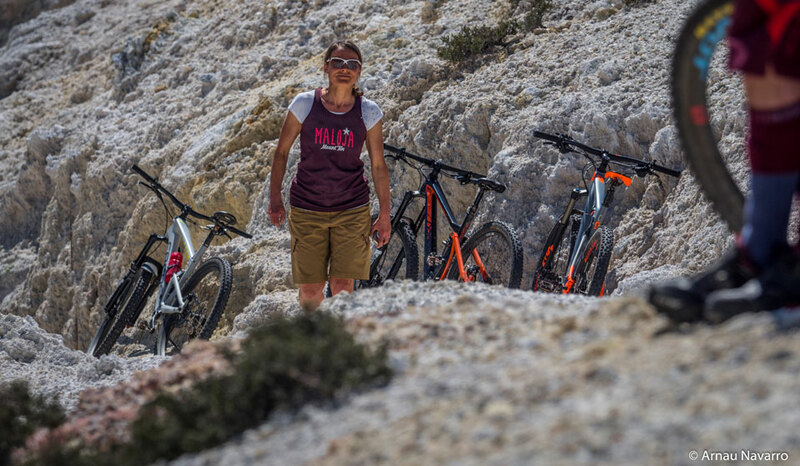 Here you can decide if you want to go straight into the crater or uphill to the beautiful mountain village Nikia. If you already turn right here and follow the sign "volcano", your tour will be about 10 km shorter and 120 m of elevation easier. However, it is absolutely recommendable to drive up to Nikia first. 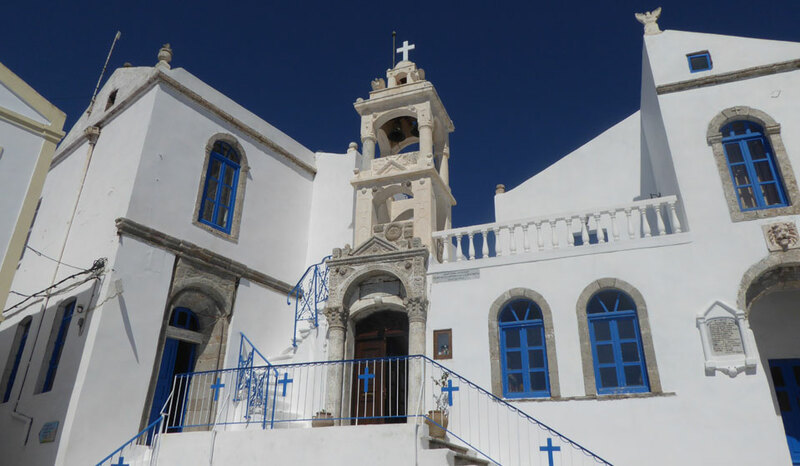 Shortly before the village you can turn right and enjoy the 360° view from the Profitis Ilias church . The view to the mountain village, the crater and the blue sea is rewarding! In the village you can take a short walk through the narrow streets and have a coffee break in the Kafenion on the picture-book Plateia. Here you can have warm chocolate cake with volcano ice cream, good coffee and much more. 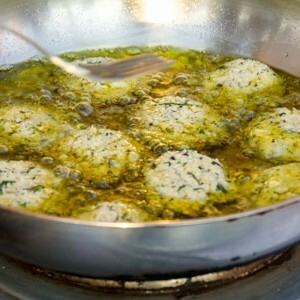 Try "Sumada" - the local almond syrup from the island. You can enjoy it as a refreshment diluted with water and ice cubes. After the break you leave the village again on the asphalt road back to the junction to the volcano. Turn left here and enter the big crater with a diameter of 4 km. You then reach a car park with a kiosk on the plain. Directly to the left is the Stefanos crater, which you can walk into. Attention: here it smells strongly of sulfur and one can look right into the earth. From the kiosk you drive back a short distance and then turn right onto the natural path. This leads slightly uphill around the Stefanos crater and then becomes 2x quite steep on a short stretch. You pass a small monastery, go downhill for a bit of rest and then another 1 km long steeper ascent follows. Afterwards it goes almost only downhill to Mandraki. Follow the same path until the underground changes to concrete. There you meet a T-junction. Here you can already see the entrance to the trail back to the harbour village, which you of course won't miss at the end of a great tour. After about 300m you reach the old Kastro with its giant walls. If you climb the walls, you have a great view of the port Mandraki. 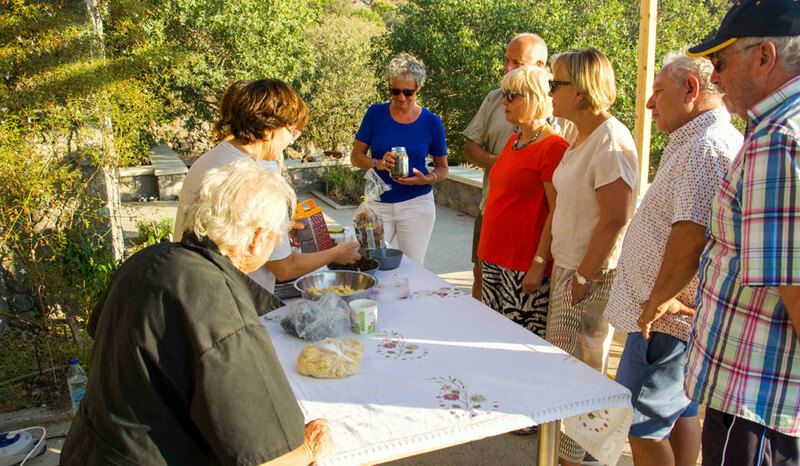 Traditional Greek cuisine lesson – have a taste of the island of Nisyros and enjoy a a great cooking class on a traditional island farm. 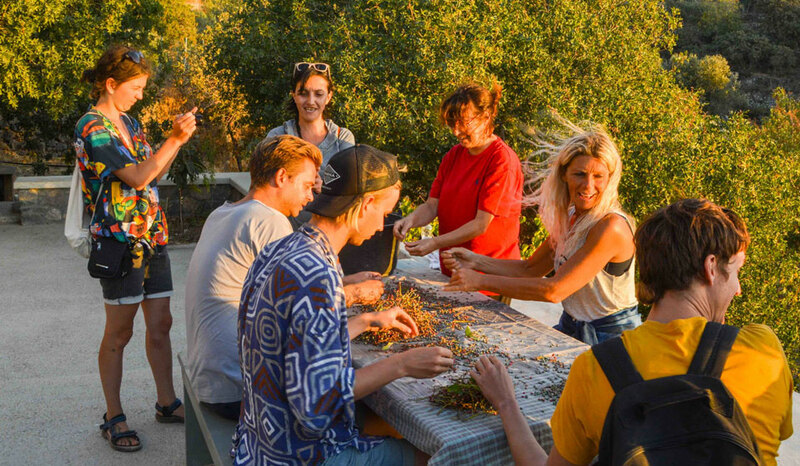 You will exclusively use organically grown fruit and vegetables and learn the recipes of the locals and step by step how to prepare the dishes! 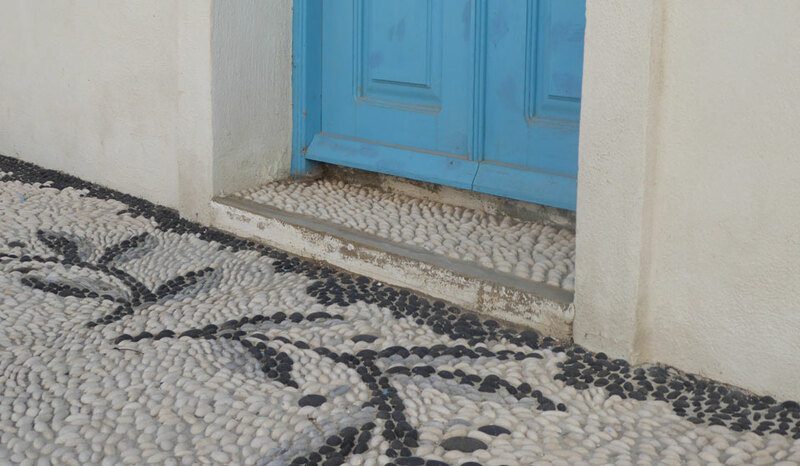 A must do on Nisyros! 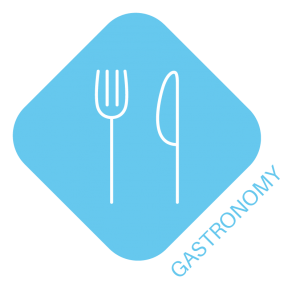 Traditional Greek Cuisine Lessons on Nisyros - The close relationship between the people of Nisyros and their land and agricultural products is reflected by the traditional cuisine of the island. People incorporate every fruit to make food and sweets, many linked to centuries-old traditions and customs. In this Greek cooking course you will prepare the traditional recipes of the island learning, step by step, how to prepare the dishes. 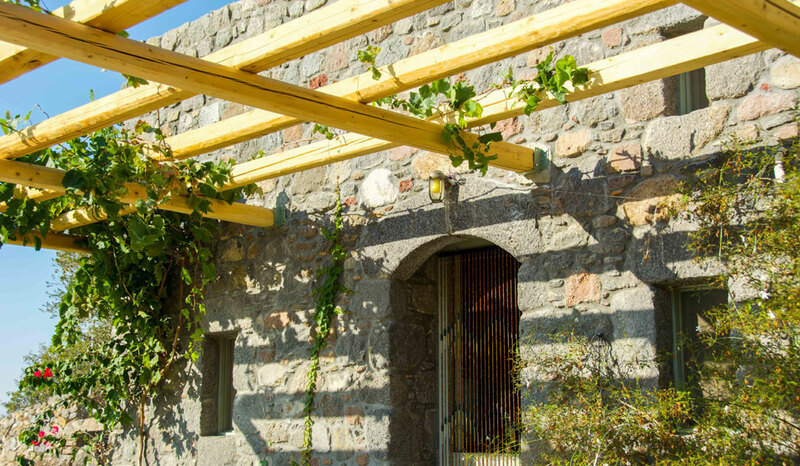 The course takes place on a farm, in the courtyard of a renovated cave. 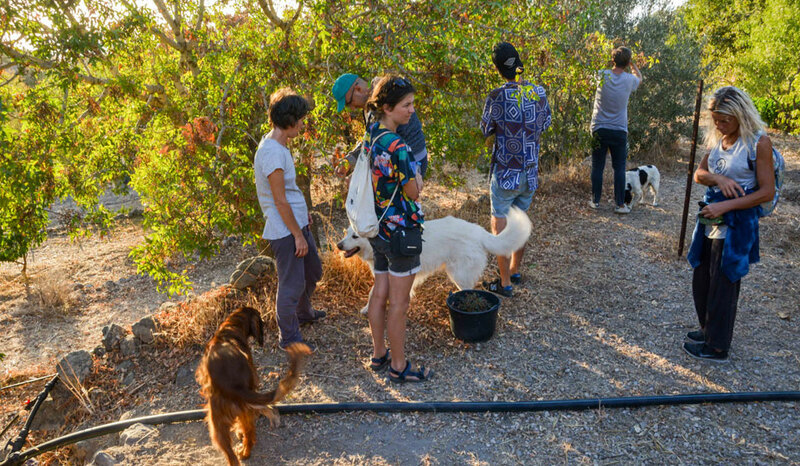 First, you will be given a guided tour of the farm to learn more about the island's cultivated plants and their varieties and also to harvest organically grown fruit and vegetables, which will later be the ingredients for some of the recipes. 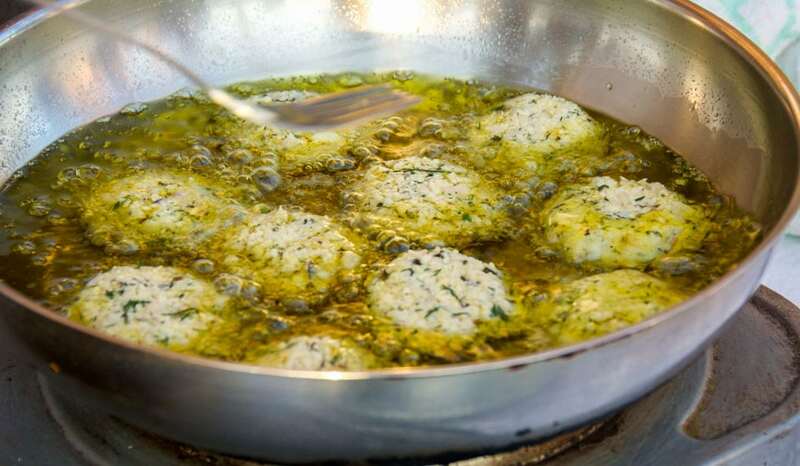 Once finished with cooking, we will set up a table in the courtyard of the cave and all of us, like a large group of locals, will eat our own creations accompanied by salads, cakes and wine. The course ends with a tasting of traditional sweets with coffee or tea. A minimum of 6 participants is required to take part in this course. Does this sound perfect? 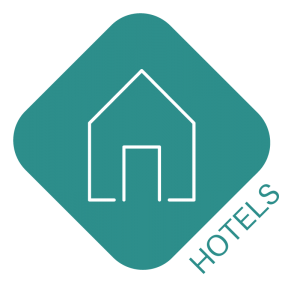 Do you have any questions or would you like to book directly? The mountain village of Nikia – characteristic Greek isles architecture, views of a fascinating natural spectacle and a unique volcano museum in Greece. More than just a village. 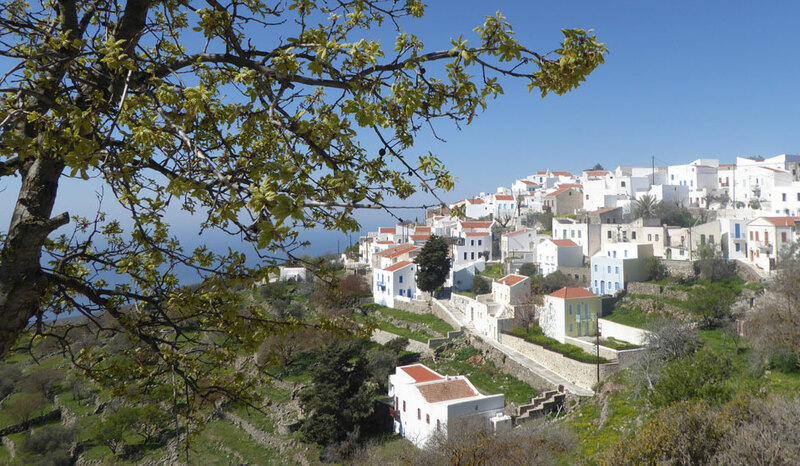 Nikia village is built on the edge of the caldera at a height of about 400 metres and looks out over the Aegean Sea on one side and the craters on the other. A stroll through the village quickly reveals its special and characteristic architecture. At the latest here the camera may not be packed away any more. The elliptical pebble square of the village is simply impressive. The church of the Assumption of the Virgin Mary and the houses with typical single pitched roofs will fascinate you. The monastery of St. John the Theologian and the monastery of Panagia Kyra are other sights of the village. Once in Nikia, a visit to the first and only volcanic museum in Greece is a must. 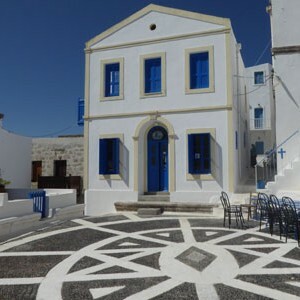 Opened in 2008, the museum has an exhibition area that includes all the rocks of Nisyros as well as rocks of other volcanoes and places to visit. Whether volcanic origin, the volcanoes of Greece, the geology of Nisyros or the connection of volcano - environment - mankind: all this and much more is vividly explained in the museum. The mountain village of Nikia - small but incredibly nice. 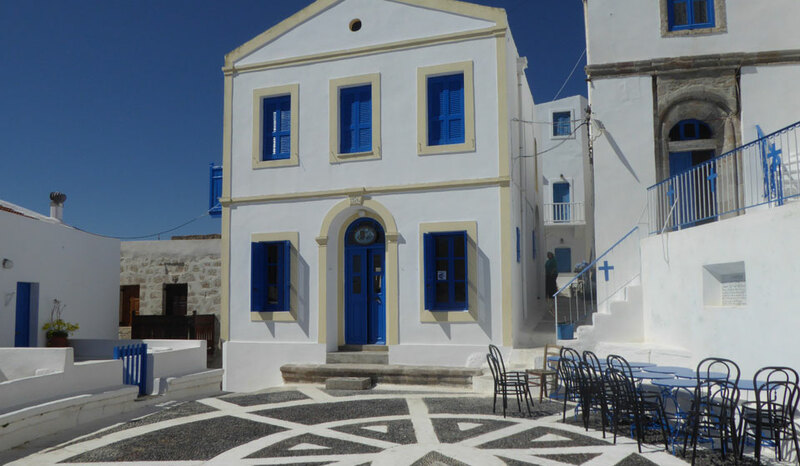 Don't miss this architectural gem when you visit Nisyros. *Please inquire nevertheless locally, since the opening times in the off-season often vary. Nisyros´ Caldera – a geological open-air museum with millennia-old history of origins and a great connection to Greek mythology! 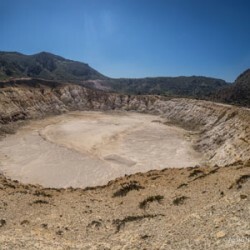 The Stefanos Crater on Nisyros: The volcanic crater belongs to the active volcanoes of Greece along with Methana, Santorini and Milos and is with 150,000 years the youngest active volcano of this country. 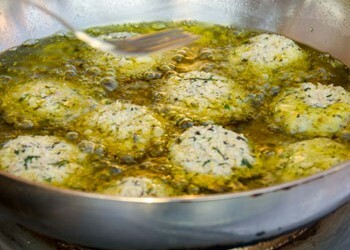 Every stone on the island owes its origin to a volcanic activity. The round island is actually just the tip of a volcano that rises out of the water. 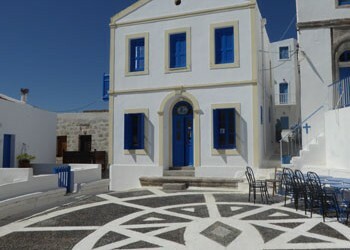 With an island diameter of 8 km there is an elliptical caldera of 4 km diameter in the middle of Nisyros, on the outer edges of which the villages have settled. Especially Emporios and Nikia offer a wonderful view. 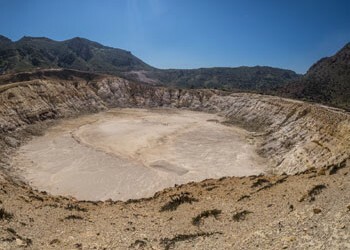 When talking about the Nisyros volcano, one actually refers to the Stephanos crater, which with a diameter of almost 300 metres and a depth of 27 metres was "new" in the old caldera. "New" means 3,000 to 4,000 years old. 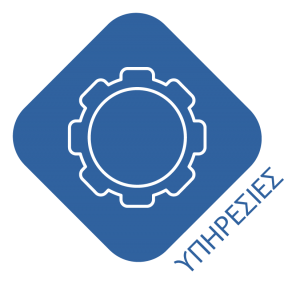 The Greek “new”. Even if the last magmatic activities are said to have taken place about 15,000 years ago, the volcanic activities have not completely ceased to exist to this day. What exactly happens? Seawater and rainwater seeping in meets a deep magma bubble. A mass of sulphur, sludge and vapour pressure is formed and pushes to the surface. 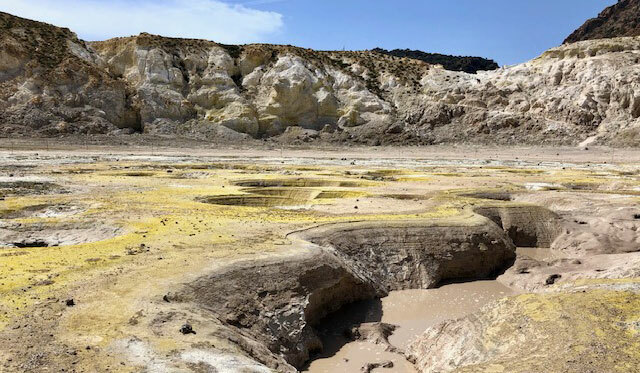 The sulphurous water vapour still emerges visibly from the so-called fumaroles to the surface in the Stephanos crater. A unique natural spectacle that amazes every visitor from a safe distance. Unlike other volcanic islands, Nisyros is rich in vegetation thanks to its fertile volcanic soil and mild climate all year round. Moreover, it is the only active volcano in the Aegean with such a rich flora and fauna. Mythological background: It wouldn't be Greece if mythology didn't also have an exciting history of the island's origins: when Poseidon arrived on Kos during the battle of the Greek gods with the giants and persecuted the giant Polyvotis to kill him, he cut off a piece of Kos and threw it at him. This piece shattered the giant and Nisyros emerged from it. The quakes caused by the volcanic effect of the island are said to be the cry of the giant Polyvotis, who tries to be break free from the weight of the rock that has covered him for centuries. Everybody can choose which version of the origin is more pleasing. 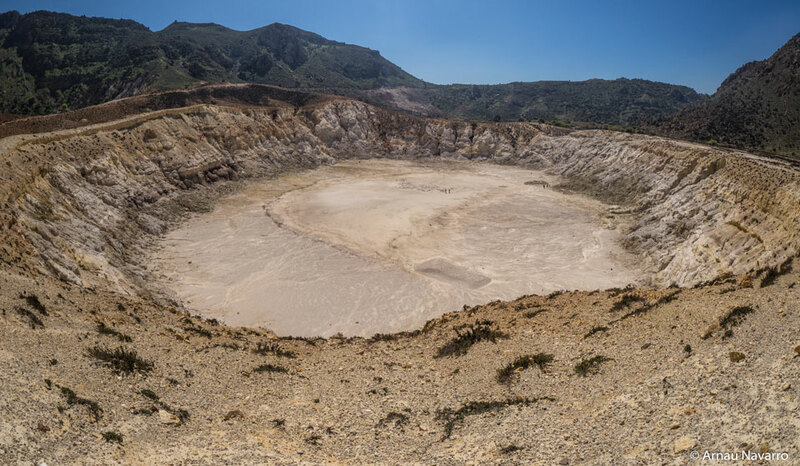 But there is one thing that no decision needs to be made anymore: Stefanos´ Crater on Nisyros is and remains a natural phenomenon of a special kind and are worth a visit. 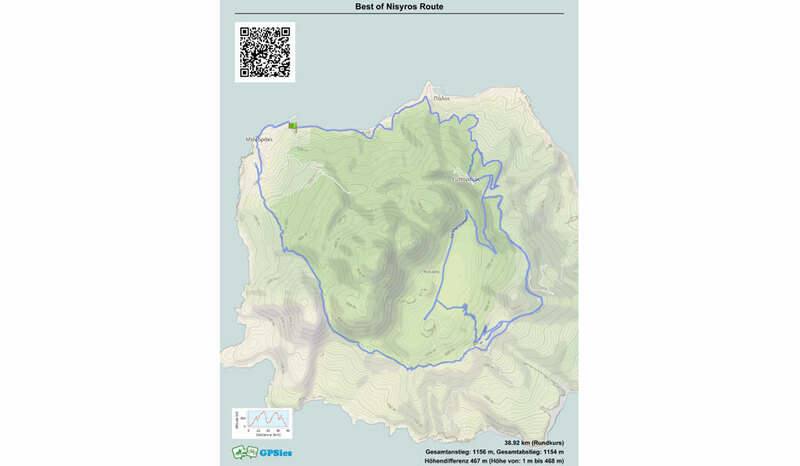 In general: Nisyros is a small island, only 50 km² and a total of 987 citizens, located in the Dodecanese, south-east of Kos. 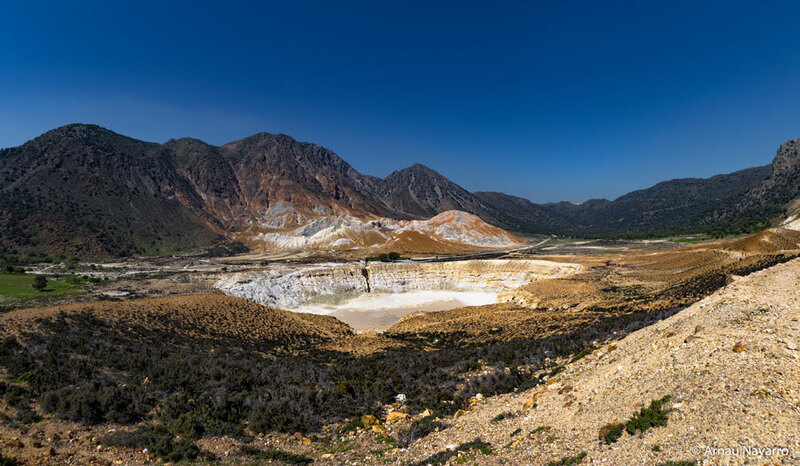 It is the youngest active volcano in Greece, characterising the island’s unique landscape and its exceptional flora. The most impressive location on the island is the crater of the volcano. The main town, is the port of Mandraki which offers a well-developed touristic infrastructure and visitors will find the most important services. The landmark of the town is the Venetian castle with the monastery of Panagia Spiliani sitting on top of a rock at the coast. 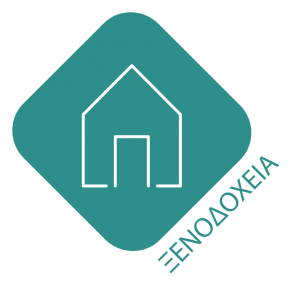 Visitors will certainly enjoy the traditional village of Nikia with its museum and traditional houses. Another must see is the village of Emporio, which was abandoned in the 1950’s due to an earthquake. Both of these villages sit on top of the crater rim with astonishing views of the volcano and the surrounding islands. Attractions also include natural thermal spas, in Loutra and the iconic beach of Pachia Ammos. All these destination can be visited by trail. 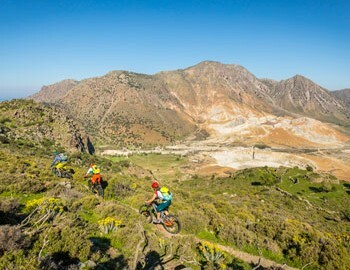 Biking on Nisyros: Nisyros has a big network of trails. 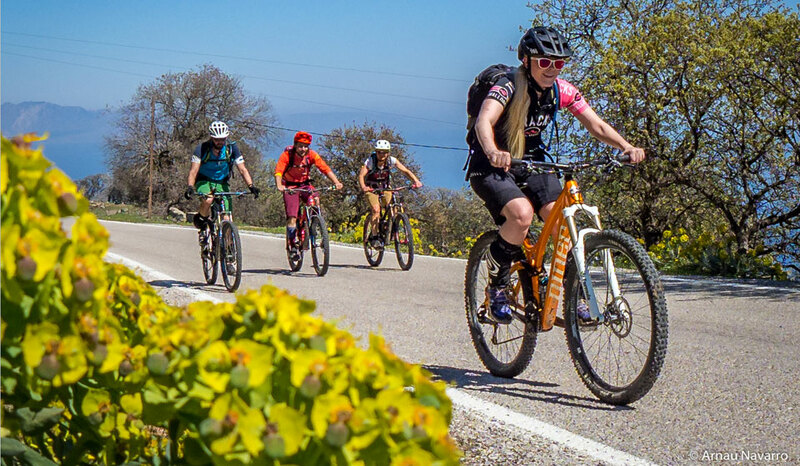 All destinations and villages are connected by trails and most of them are ridable by bike. 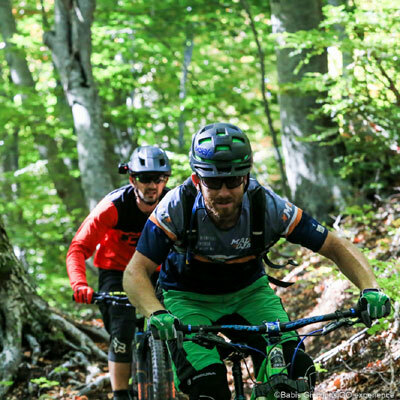 Recently, many trail maintenance activities took place to make the trails safe to ride and to hike. The most iconic ones, start from high on the volcano crater and finish inside the crater itself. 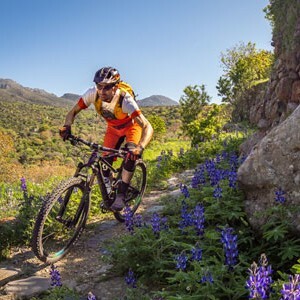 Most of the trails are technical, but there are also easier options for less experienced bikers. 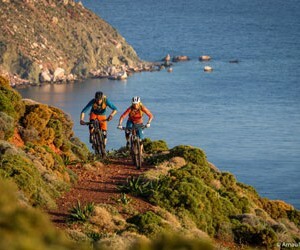 Other outdoor activities: In Nisyros you can enjoy hiking and water sports. 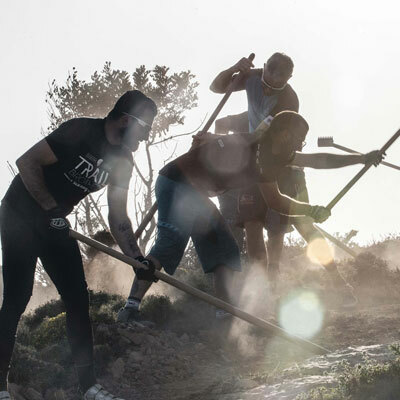 Especially hiking is very popular on the island and the local initiative ANAEMA shows great commitment in opening and maintaining the historic footpaths of Nisyros. Furthermore, they offer guided hikes and cultural excursions on this stunning island.